And now a thing that only bothers me. The reason I bring that all up…when I was but a young Mikester, I grew up with the idea that Clark was Superboy first, then Superman later. The Superboy stories took place “in the past,” while Superman stories took place in the present day. Now, “in the past” was this nebulous period that ranged from the ’30s to the ’70s, depending of course what period of Superboy you happened to be reading. This is probably what is creating this odd sense of dissonance I have as I’m watching Smallville , which is, for all intents and purposes, “The Adventures of Superboy.” Suddenly, “Superboy” is the present-day storyline, while “Superman” is a thing that, while we’re aware it’s going to happen, won’t be happening for a while yet. (Okay, it’ll probably happen in a few months, at this end of this season, but this has been the tone for the series since the beginning.) Not having Superman as the present day, current version of the character feels…I hate to say “wrong,” because it’s not, it’s just a new interpretation of the character, but to this old fanboy who’s read more comics than is probably good for him, this alteration of the traditional Superboy/Superman temporal relationship to the real world calendar does stir up strange responses in me. And the most strange response is actually typing the phrase “alteration of the traditional Superboy/Superman temporal relationship to the real world calendar” for which I have no excuse. Anyway, that’s been bugging me for a while, so there, it’s finally off my chest and onto my weblog. Where it belongs. The very brief snippets of Superman-type action we’ve seen over the years makes me wish we’d get more than, maybe, the one episode we might actually get of full-on Superman adventures in this series. I’d particularly like to see more of 2017’s no-nonsense Clark Kent that we saw all too briefly. Would I want another season of (let’s call it) Metropolis , focusing on Superman, from the same folks? …Maybe if they dialed back the “emo” a bit. My wife loves how the show seems to be kind of anti-emo this season. Between Brainiac and Lois, the characters are essentially telling Clark to quit being so whiny. As much as I’d like to see Superman, I’d be intrigued by the Adventures of Supertot! Print news media survives seven years in the future?!? 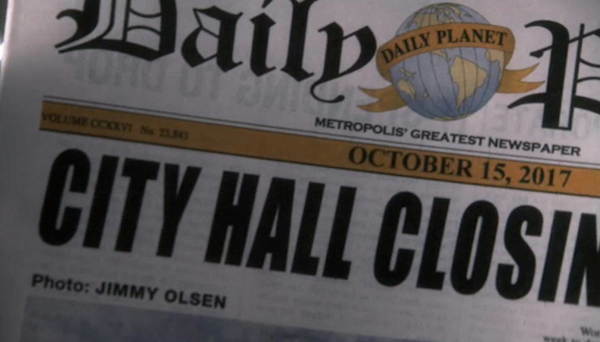 The “replacement” Jimmy was set up in the episode where Smallville’s Jimmy died… his camera was given to his nephew, who was also named Jimmy… rather, James Bartholomew Olsen (the show’s Jimmy had a different middle name, not matching the comics one). Obviously, the Daily Planet still exists because the owners are much more technologically aware than our newspapers and managed to exploit the possibilities of the internet more… Plus, with Superman stories in pretty much every issue, that’s a pretty big selling point, I guess! As someone who has never watched an episode of Smallville, I had no idea what you were talking about at first, but after reading your thoughts I think I know what you mean. I feel the same way but opposite. I think very the idea of a contemporary Superboy causes some fan-boy vertigo in both of us. But our heads are spinning in opposite directions. It’s not just you, Mike! It’s just one of many things that bugs me about the show. I don’t have as big of a ‘temporal displacement’ problem because I don’t see Smallville’s version of Clark as either Superboy OR Superman but more of a (original to the show) Super Man-Boy. You know how the media is always talking about a new transitional period young adults are going through in between being a child and an adult. I think the Smallville TV show accurately represents this. I’ve been reading comics since the sixties. Back in the day, Superboy and The Legion always seemed to be the more vital and “current” of the Superman titles. Superman and Action seemed to be coasting. Plus, Superman always seemed to be “my dad’s age,” especially when drawn by guys like Wayne Boring and Curt Swan. In the DC Universe, it is always the fifties in Smallville, just like how in the Marvel Universe, “the past” is always WWII. Wait, Clark Kent is SUPERMAN? I thought he was “The Blur”!